I Turned 61 Today--Am I Old Yet? Christmas Eve morning, I noticed Abby (our dog) came limping to breakfast and walking much slower than usual. Then when it was time for her walk, she just sniffed around by our bushes, then walked as far as the sidewalk and sat down. We knew for sure something was wrong so called our vet and they said they had an opening at 9:00 and of course recommended that we bring her in to have her checked out. We lifted her in and out of the car and the vet turned her leg and neck in all directions and proclaimed, nothing seemed broken. We increased her daily Metacam dosage to the max allowed for her weight and put pillows by the furniture that she jumps off of to soften her landing. All we can do is just take her out to do her business to rest her leg and see what happens. interested in too was the Blue Mountain Senior wet canned dog food. Oh, she was so excited for that and the cats both came over too trying to get some. We gave her half on Christmas and she'll get the other half of the can today. Here's just a short video to show how she is limping along this morning. It's hard to believe Christmas is this Thursday! I guess without snow and real cold weather, it doesn't seem like it should be here yet, but it is! I put up our tree this year and the manger scene, got my shopping done early, mostly from catalogs, and even bought some Christmas cookies yesterday! We have a quiet Christmas around here. Sometimes I miss the family get-togethers and not having children makes for a lot less fun, but it is a relaxing time for us. We exchange gifts, give our pets something special and just enjoy the time together watching movies or going for walks looking at the neighborhood lights. I do look forward to going to the Christmas Eve service at church which is always uplifting. It was a blessing to see two of the kids in my Sunday School class get baptized this morning, but was a bit disappointing that I only had two in my class today. Guess some families have their family Christmas gatherings today. We wish all our readers a very Merry Christmas! Cake I picked out at Giant Eagle for myself--very sweet but the penguins called to me! I had a nice birthday today and was showered with gifts. We splurged a bit and had lunch at Cracker Barrel to celebrate using a gift card we bought at Giant Eagle so we get fuel perks out of it too AND guarantees me getting to go back again since we spent less than the $25 gift card amount! "You've Cat to be Kitten Me Right--Meow"
That's what the puppet team's thought was when I told them I was 61 today. It always makes me happy with people think I'm at least ten years younger or more than I really am. Peter Pan is my hero! This Browns sweater is from Abby who cheers along with me when the Browns score. I always wear orange and brown on Sundays and Fridays during football season to show my support and sometimes even on Mondays if they win on Sunday. Now if have another orange sweater I can wear besides the same one all the time--thanks, Abby! Furry Siberian Tiger leg warmers! When I opened the package, all I saw was fur! I couldn't tell what they were but then Gerard told me. I love leg warmers on really cold days and expect these will for sure keep my legs warm! They are very soft too but don't worry, it is from Fabulous Furs, the Faux Fur experts. Of course, the best part of my birthday was that it came on Saturday so I could spend it with my husband and our pets, watched the Army/Navy game. Funny, I don't feel any older. Thanks for making my birthday a happy day! We are beginning a new phase of our life together since my hubby's last day of work was Friday. He turns 62 on December 3 and will put off taking any Social Security, but he couldn't wait to be done with work. After working at the same warehouse for over 40 years he is ready to take it easy and certainly deserves it! Sue (a friend and temporary co-worker) surprised him with a big cookie earlier in the week and one of the guys took him to lunch at Manners--a favorite restaurant of his since he was a kid. This is a picture of one happy guy with his retirement gifts: a fancy wristwatch and a Manners Big Boy Bobblehead, wearing his high school t-shirt in honor of them winning last night and coming one more game closer to the State Championship. He also got a juicy check we were not expecting (which he already gave to me) that we deposited into our savings account today. Finally, he brought home half a sheet cake from Giant Eagle to share with me! It is very good so we won't have to buy any bakery for a while. 1) Driving to and from work every day, especially in bad weather. 2) Eating lunch and taking breaks only at specific times each day. 3) Being stuck inside on nice days. 4) Getting so dirty every day and all the heavy lifting. 5) Listening to the same radio station all day long Monday through Friday. 1) Not having to juggle the cars back and forth and leaving one out in the drive all night. We got a $5,509 check Thursday for selling our KIA to save on insurance and repairs. 2) Being home with the pets more, especially Abby Dabby Doo and taking her for an extra walk each day. 3) Not having to rush to get all his housework done. 4) Having more time in the spring and summer to work in the yard. 5) Visiting the zoo more often on weekdays and hanging out at the library. 6) Maybe volunteering to be a dog walker for the Parma animal shelter. 7) Being able to stay up later to watch his sports teams when they have night games. 8) Not having to get up at 4:15 a.m. during the week. I am so happy for him and glad that we are able to manage on just one salary and our savings. It will be nice having him home to run errands or be there when repairmen have to come. It will definitely be nice not hearing him moan when it's time to get up every morning. Since we are now down to just one car, he has agreed to be my helper in my Sunday School class, at least until the weather gets nice again when he may choose to walk home earlier. But for now, I'm glad to have him! HAPPY RETIREMENT, GERARD! I LOOK FORWARD TO THE DAY I CAN JOIN YOU! I actually like my new shawl that my hubby gave me on the anniversary of the day we met. He, of course, consulted the pets and came up with the perfect one for me that he found on the Animal Rescue Site (those are paw prints, sorry a bit blurry). It's soft, gives me just enough added warmth so we can keep the thermostat in the 60s, and even has two pockets in it! I keep telling myself, shawls are NOT just for old ladies, are they? You are the best dog we could ever have! You won our hearts the first day we met you with your soft thick fur, your big beautiful brown eyes, your sweet personality, your curly fluffy tail, your big smile and your gentleness. I am amazed at how well-behaved you were from the first day we met you. You got along with our two cats just fine and fit right into our family with no problem at all. I love how all kinds of people are drawn to you. It was so much fun taking you to dog training classes at PetSmart because you managed to make people laugh and still were the best at following commands most days. You are so eager to please and easy to train. We are so proud of you! I love to watch you enjoy the outdoors and wish we had an area where you could run off leash like you did at the park the one day when the clasp broke off and you got in a good run. I couldn’t believe how fast you could go and how happy you were that day! The bond you have with Gerard is heartwarming to me. I know you will always be a daddy’s girl, but just hope you know how much I love you too. I enjoy feeding you breakfast every morning and reviewing the commands you learned. I like giving you big hugs and belly rubs too. You are such a good dog and I am so glad we decided to look on Petfinder for you when we did. You have certainly enriched our lives! Also got to read A Letter to My Cat. The pictures in this book are gorgeous! Why not write a letter to your pet and post it on your blog. Then leave the link in the comments. I had my first MRI ever this week. I had no clue what it would entail so asked my surgeon and he said, it uses magnetism and takes a better picture than the mammogram. Well, first they inject dye into you which they couldn't do the first time I went because my veins were too small in my left arm. When I had my lumpectomy done five years ago on my right breast, don't ever let anyone take your blood pressure, vaccinate you, or take blood or poke you in your right arm. Always use your left. Now all of a sudden, my surgeon says "It's a small risk, go ahead and let them use your right arm if they have to." Well, the technician really liked my vein in my right arm and got the dye in the first try with no problem--it didn't hurt at all! I had to lay still on my stomach though for half an hour. I never lay on my stomach so wasn't exactly comfortable but I managed. Then she game me headphones to help drown out the loud noise. It really was LOUD and sounded like a jack hammer pounding right in my ears. She added some music but that didn't help-it just made it even more annoying! I was relieved it was over and I was out of there in an hour, but by the time I went to bed, I had a headache and woke up with it. Not sure if it was from the loud banging noise in my ears for so long or just from all the stress. I actually took an Advil and totally skipped my morning computer time and laid down instead! Even my husband asked me what was wrong. I actually missed my bus stop coming home twice this week and not just by one stop, but by 3 or 4! It still wasn't too far a walk home but the first time, I was reading my book and just couldn't keep my eyes open because I was so tired. The second day, I was engrossed reading the same book (REVEALED by Tamera Alexander)and missed it again. My Indians are now officially out of the playoffs but they had a good season and hung in to the end. 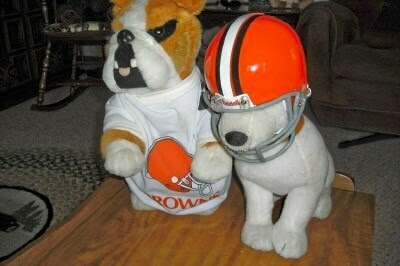 I'm hoping the Browns can put some wins together this year and win over half their games. They are 1 for 3 but each game went right down to the end. So far I have six kids in my 5th grade Sunday School class and am loving it! They are SO good and all are really trying to learn the memory passage (Proverbs 3:3-7) which is one of my favorite passages. One of the boys quoted it all last week and one girl stayed after to try learning it all--it was the first time she came! I found exactly the prizes I had in mind at Walmart: candy, cookies, munchies at $1.00 each. I was thrilled because when I looked for these things at Giant Eagle, I couldn't find them. Next step? Look into window treatments. My husband gave me a real scare last Sunday. On the way home from church I got a call from him whining saying "I had an accident!" I asked him where he was and he said outside our house. I was only about 3 minutes away so said I was close and would be home soon. (I really like our Ford Escape which has a cell phone feature that I can answer and talk on my cell without taking it out of my pocket, so please, no lectures about using the cell phone while driving.) Turns out he was just fine, and his "accident" was spilling the dog's water while falling over our cat, Manny Boy who ran right in front of him. The water got on our newly painted kitchen wall and made a big ugly spot. He's such a drama queen. I was so glad he really wasn't in an accident! Yesterday was nice enough to go to a nearby park area at lunch time. I had some multi-grain chips with me, but unfortunately, I think they attracted a bee. This bee came really close to me and I was afraid it was going to crawl on me. I got up and it followed me so I dropped the bag of chips on the ground, hoping it would follow the bag, but it didn't. Finally, after standing relatively still and praying that God would protect me from this bee so I wouldn't get stung, I no longer saw it's shadow and so picked up the bag, closed it up tight, walked the rest of my lunch hour and finished my chips when I got inside. I had another CRAZY busy week! I am feeling like a juggler lately, trying to keep everything going but at the end of the day, I think I was only caught up one out of five this week even with working 45 minutes extra. I look forward to a better work week next week with my main boss out of town all week and the secretary who was on vacation that I backed up for will be back. We are very pleased with how our rooms turned out and that everything is back in the right place. I moved some pictures around too. I'll put pictures up in a separate post this week. Whew! 1st Grade - Did not want my picture taken! Talk about serious! Did you ever see a more serious first grader? This is me in my favorite dark blue navy dress before I got my glasses and when I was the only child in our family. I think I look pretty tough in this picture like I'm thinking, "better not mess with me!" I like this picture of me--it really captures my personality at the time. Then, I go from that to worse! By fourth grade, I looked like this. I absolutely hate this picture of me. My mom liked curls but went a bit overboard for my taste. I didn't like this dress either and the glasses make me look dorky I think. I did smile for this picture, trying to make myself look nicer. Which picture do you like better? I left work early today because I had to go for an MRI. When the technician came out for me, her first words after "How are you?" were "I'm sure you heard about the horror stories with MRIs." I said, "No, I haven't, and I don't want to." What a greeting! Then when she was trying to give me the injection, she couldn't find a vein big enough. She tried about five different places before she finally gave up and said she couldn't do it. She tried calling my surgeon who ordered the MRI to let him know and see what he wanted to do, such as maybe an ultrasound, but his office closed early today. She'll call him in the morning. I'm not sure what to think about this except that I'm in God's hands and He is in control. At least I saved my insurance company some money. They should thank me for my tiny veins. Too bad I wasted 3.5 hours of my personal time off though; not the way I would choose to use it but at least I didn't take off the whole day. Does anyone else have small veins like me? Later this week we are finally having Sue's Helping Hands lay down tile in our kitchen, dining room and bathroom. Although it will take 3-4 days since Sue is working alone (so far her helpers are all busy), it will be worth it. The linoleum is so old, Gerard can't get it clean anymore which is extremely frustrating for "Mr. Clean." I never did like the kitchen linoleum but chose to live with it for 17 years. We will be using the same color tile in all three rooms to provide some continuity. In the meantime though, our living room will be loaded with all our dining room furniture and perhaps the kitchen table as well. Since we won't be able to walk on the new tile for 8 hours, the kitchen and dining room have to be done in sections so we can get to our front door. At least one of the days, we will have to go out the front door and in the side door to get to the basement (Gerard's bathroom is down there). Not looking forward to the obstacle course part. I never heard of Raycom Media until this week when they pulled Channel 19 from DirecTV so I can't watch the Browns/Steelers game tomorrow at home. Now they also pulled it from Dish and Cox! This is really mean and greedy of Raycom Media, owner of Channel 19. Boo on Raycom Media! I am upset about this but I guess I won't be watching many Browns games this season unless DirecTV can come to some sort of agreement. Maybe one of my friends will be able to get the game, and invite me over to watch with them. I can only hope! Hint! Hint! As of Sept. 1 when this article was posted, Raycom is supposedly trying to reach an agreement with DirecTV but it doesn't look good: Raycom Media Continues Negotiating With DirecTV. UPDATE: They reached an agreement the day of the game! I was able to watch the Browns come from 27-3 at half time to tie the game and lose it in the last 10 seconds with a field goal by the Steelers. Too bad they didn't start playing until the second half. 1) They actually had a running game going even with the first string running back hurt and out of the game early. 3) They did much better than I expected. I thought they would get blown away. This week we found out that there is a dispute between Fox and Direct TV which basically amounts to not being able to watch the Browns games on DirectTV. Again, due to plain greediness on the part of Fox, wanting Direct TV to pay double for the otherwise free programming. I don't quite understand it, but hope I can find somewhere to watch the games. My brother-in-laws funeral was quite different from what I am used to since he was Catholic. I never heard of having "prayers" at the funeral home first and then moving everyone over to the church for the mass. I don't understand why they couldn't do it all at the church. I thought it was kind of nice though when the funeral procession turned down his street to take him by his house on last time. We're finally almost done. Our living room and dining room should get finished today, I hope. Right now, our living room is completely useless since even the TV is unplugged. I get a headache when I look at the mess. That's it, gotta go to work. I'm out. I am a very good dog . . . usually. Of course, there is one exception and that is when I find a nice salad bar, I like to take my time and enjoy it. See how my mom is trying to pull me along with my blue leash? I held my ground though and finished my salad, ignoring her commands of heel and come. If she had brought treats along for me, that may have made a difference. Hint, hint. Hope you all enjoy the journey as much as I do! But look at Bloggers, My Mail (Sorry I couldn't link to the post so linked to the blog), I am on Ellen Cooney's blog, author of The Mountain Top School For Dogs and Other Second Chances because she liked Gerard's review of her book and my picture with it! See, I really earned that salad break! Woof! Woof! 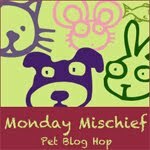 Joining in with Monday Mischief and Aww Monday (thanks, Sandy, wasn't sure this would qualify) blog hops today. Today we spotted a father putting up a sign with his little boy advertising his lemonade stand which was just a street away--I haven't seen too many of these. First I drove by to just see where it was, then my husband walked by to check on the price and after the Buckeye football game, we all took a little walk over there for some lemonade. They accepted any amount and the money was going to help kids who had Cancer. Abby was a hit, of course, and enjoyed sitting in the shade of their little canopy they had up. She chose to sit right under the tap so she even had some lemonade drip on her head! The lemonade tasted good on a hot day. By the time we got there, the kids were on break and the adults were running things. We went to see a good High School football movie, "When the Game Stands Tall" and had a private showing. We were the only ones in the theater at the 10:50 showing on Tuesday. The movie was very good with a lot of good parts and we both liked it. We chose this one over "If I Stay" and I'm so glad we did! The painting of the bathroom, kitchen, living room and dining room began this week. So far so good on the pet front. 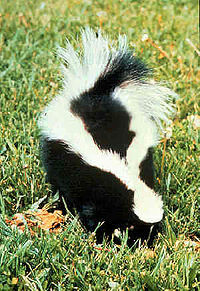 None of them got into the paint, went into the heat ducts or brushed against the walls while they were wet with paint. I'm glad it dries fast because I did have a bit trouble keeping Spunky Doodle off the kitchen counter after the painter left. If you are in the Cleveland area, I highly recommend using "Sue's Helping Hands" for painting or handyman needs. We are loving the purple we chose for the kitchen and bathroom! Watch for the surprise color in the living and dining room . . . Gerard did want the gray so we chose a different color instead. 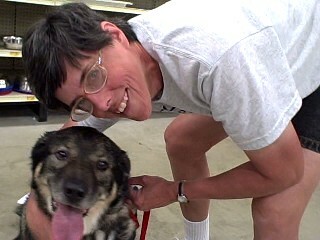 Abby is greeting Sue, the painter, when she came back for day 2. I was down in the dumps when is saw the words "suspicious area" AGAIN referring to my last mammogram. This is the wording used when I was diagnosed with breast cancer in 2009. I am optimistic though after my appointment with my surgeon who said he thinks it's probably just scar tissue from my surgery after not feeling any lump; however, he recommended that I have an MRI done just to confirm it. It is scheduled for Sept. 10. I am really hoping it's all okay! Yesterday was much cooler than it's been so was perfect weather for the zoo which we took advantage of. The animals were all lively and we had a fun time watching them. The snow leopard was pacing right by the glass so we could see him close up (I so wanted to pet that big cat!). The elephant was reaching up with its trunk to eat the straw that was hung up; the beaver was swimming and taking a shower under the waterfall; the wolves were actually running around (probably because the noisy planes practicing for the air show were flying over their area). The meerkats were cute as ever and there was even a baby one! We actually bought a couple 3D wolf placemats that match our seat covers on our dining room chairs. It's so nice being off work, we hate to see this week end!